*This is a bag,perfect suitable for travel,camping,climbing and other outdoor activities,during the happiness time you spent in your outdoor activities,you should prepare a medical bag for dealing with the unexpected emergency cases,this is a practical tool for you. 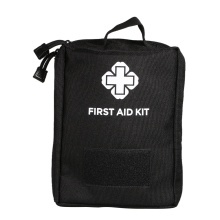 *Small size&large capacity:It can carry lots of things as you like,such as keys,wallet,phone,medicine,first-aid accessories and other small personal items. *Made of waterproof material,water resistant makes it can be used without much limitation,light and portable,easy to carry around in any environment. *In the inside of the bag,there are lots of pockets with different sizes for your different items,very convenient and practical. *Perfectly suitable for outdoor activities such as travelling,camping,hiking,biking and etc.You can collect all your things that you want to take with in this bag,in this way,it can avoid the missing or the time wasting for looking for them.In addition,with the first aid bag,you can also equip with first-aid accessories in case of emergency cases.